As per an agreement between India and Myanmar, the locals on either side can move up to 16 km within each other’s territory without documents and stay there for a while. GUWAHATI: Eight suspected Rohingyas, including two women and four children, were arrested by the police in Tripura on Wednesday. The police said the arrests were made at Khayerpur, some 12 km north of state capital Agartala. The accused persons, belonging to two families, will be produced in a court on Thursday. The infiltrators could not produce any valid documents barring refugee cards issued purportedly by the United Nations High Commissioner for Refugees. “We are examining the refugee cards. They appear to be from Myanmar but as of now, we are not sure if they are Rohingyas. They are in the custody of the police and being interrogated,” senior police official Pradip Dey said. There have been a few cases of infiltration of the Rohingyas into Tripura through the India-Bangladesh border in recent past despite stepped up vigil by the Border Security Force. Rohingyas, arrested in India, often claim that they entered the country in search of jobs. 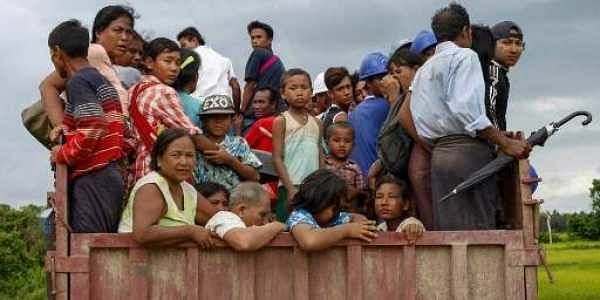 Meanwhile, some 1,200 Myanmar nationals fled to Lawngtlai district of Mizoram recently in the wake of a crackdown on Arakan Army, an insurgent group of ethnic Muslims in Myanmar, by the country’s military. According to defence sources, the Assam Rifles, which guards the India-Myanmar border, has deployed its personnel in vulnerable areas along the border to prevent Myanmar insurgents sneaking into the state.